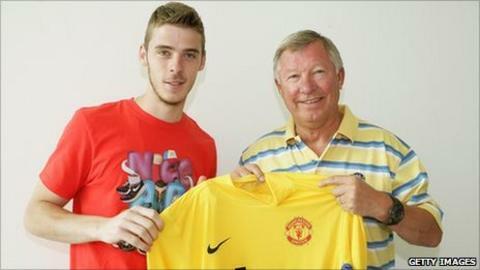 "I feel very proud and I can't wait to start playing here," De Gea told MUTV. "When a club the size of Manchester United comes in for you, it obviously makes you very, very happy. I'm keen to do my best and show what I can do." De Gea, part of the is a product of Atletico's youth academy, spending his first professional season with the club's reserves in the Segunda Division B before making his senior debut as a substitute in the Champions League against Porto in September 2009. In May, United manager Sir Alex Ferguson confirmed the Red Devils had been working on the De Gea deal for "quite a while". "He's a young goalkeeper, very quick, good composure, presence and an outstanding replacement for Van der Sar," Ferguson told the club website. The hardest person to replace in your team is always the goalkeeper. De Gea is only a young boy, so it will be very intriguing to see how he goes. "We were looking for the same type of qualities as Edwin, because the one great quality Edwin always had was his composure and organisational ability." And, upon completion of the deal, De Gea added: "I saw Man Utd's interest as an extra motivation to work even harder to show off my ability. Ferguson currently has goalkeepers Tomasz Kuszczak, Anders Lindegaard and Ben Amos on his books but De Gea is widely expected to be the Scot's number one in the new season. The deal takes the Premier League champions' summer spending past the £50m mark after the acquisitions of defender Phil Jones from Blackburn and Ashley Young from Aston Villa.